Having a minimum post count required to post links will solve this issue: spam from users and/or bots that make short and, most often, irrelevant posts, with their link, then leave the site forever. 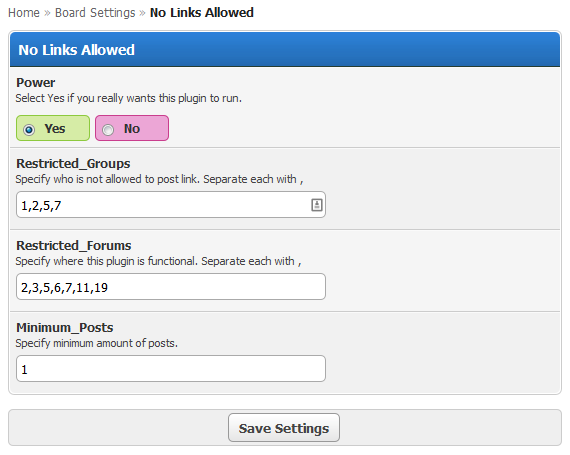 Simply use a plugin to stop bots and one-time users from spamming your forum with links. It’s not what it sounds like, but it’s darn close. No Links Allowed is a plugin originally for MyBB 1.6 that only allows links to be posted if the user has met a minimum post count. It can be modified to work 1.8 if that is what you have. In addition, you can set what forums it affects and what forum groups are limited. Click here to download from MyBB.com . It deny the use of click-able links to post them while creating a thread or posting a reply in selective forums only and only from selective groups until they reach min. post count. Simply upload the plugin file: no_links.php in ./inc/plugins/ folder and activate the plugin via ACP > Plugin Manager. It’s the same as 1.6 but edit no_links.php as follows. Spammy links will ruin your forum quick. Stopping one-time users from posting the url to their site by requiring a minimum post count will help keep your SEO strategy healthy. Google hates spam and so do your potential visitors.